If you’ve never played ladder ball, you’re missing out on the fun. Earn points by tossing and landing bolas on the opponent’s ladder rungs. Score one point for the bottom rung, two for the middle and three for the top. Best played in teams of two, the pair that reaches exactly 21 points first wins the game. 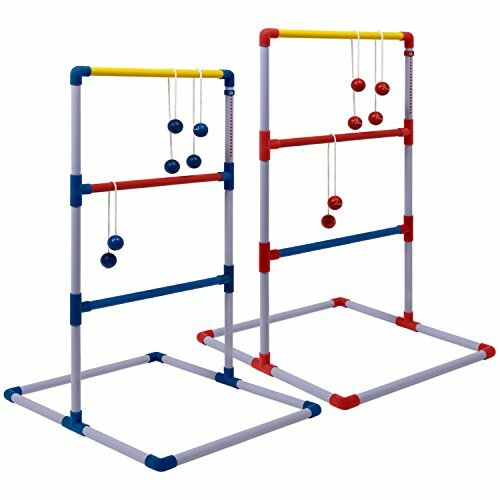 This pro ladder golf set includes everything you need to play, including two sturdy plastic ladders with built-in scoring and six bolas, each consisting of two weighted and spongy golf balls connected with a string. A convenient carrying case is also included. Our golf ladder game is a fun party activity for adults, children, teenagers or the whole family, providing hours of entertainment at any outdoor or backyard event, including summer barbecues and cookouts, birthday celebrations, pool parties and holiday shindigs. This lawn game sets up in minutes. No tools are required, and assembly is easy enough that kids can do it. The ladders have a deep base that makes them sturdy and stable, even on sand or uneven grass, yet they quickly collapse and fold up for convenient storage and carrying. Take this lightweight and compact yard game on the road. Pack it in the car for family vacations, camping trips, beach or lakeside days, tailgate parties, picnics in the park, family reunions, school events, summer camp stays and so much more. CSG Deluxe PVC Ladderball Game - Complete Set!